Bought a pair for my Mum who’s in her 70’s, a huge gardener with what she describes as ‘funny feet’. Finds it difficult to find comfy shoes to slip on to garden in. Sloggers are it!!! She loves them and as she lives in rural Victoria, they are fantastic in all weather, sloshy, muddy, sloggers are made for all weather! The huge bonus is they have good grip, which as you age becomes more and more important, safe shoes! Has made me the favorite child!!!!! I think I need to get some too!!! 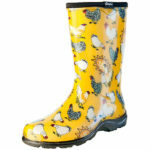 I bought these great garden/rain Splash shoes as a birthday gift for my daughter. She loves them. They are so comfortable and very stylish. I bought myself the Slogger Slush boots but I will definetly be shouting myself a pair of the Splash shoes as well. Wouldn’t be without my Sloggers. Great garden shoes I wear mine daily in my nursery they have outlasted any other shoe. Last pair lasted 2 years tread was still great but naughty me walked on the heals and they came unstitched but perfect excuse for a new pattern. ? Have referred so many people who all love them too. Wonderfully comfortable and practical. Easy to get on and off. Good gripping tread on soles. Love them. Love my chook Sloggers have nearly worn them out, where them everywhere and get lots of lovely. Highly Recommend this company, pleasure to deal with. I bought these for myself and love them. The products and the service is great. I would recommend them to all . I bought a pair for myself on a recommendation from my sister and love love loved them so when my friend was coming to stay who loves gardening and walking her dog as I do I had to get a pair for her too, I was very happy with the discount from the points I had accrued from my first purchase and the free postage, not to mention they arrived in a matter of days! the lollies taped to the receipt were a sweet touch too 🙂 Would highly recommend the products and the company, the service is second to none.